Shelton, CT, March 2017 – Centrix, Inc. is proud to announce that Couture™ Diamond Polishing Paste and Couture™ GripStrip™ have both received “Best Product” awards for 2017 by a well-known independent dental research organization. Fully 83% of evaluators would recommend the Couture Diamond Polishing Paste for professionals who prefer paste polishing. Centrix Couture Diamond Polishing Paste is a uniquely designed, extra-fine diamond grit paste with smooth, splatter-resistant consistency for ease of use. Fast, one-step final polishing uses very small particle-sized diamonds to produce an ultra-smooth surface with high luster. Couture Diamond Polishing Paste works faster, with a feather-light touch, to give better esthetic results compared to traditional aluminum-oxide polishing pastes. Smoother surfaces limit the adherence of plaque and bacteria, helping prevent subsequent development of gingivitis and periodontal disease. To learn more about Centrix Couture products, and other Centrix innovations, ask your dealer or call Centrix at 800.235.5862. Please also visit our website at www.CentrixCouture.com. Centrix is a leading innovator of dental materials, preventive products and applicators and delivery systems. Along with the Centrix C-R® and Mark III syringe guns, we provide the most comprehensive line of syringe delivery systems. We pioneered the first one-piece disposable dental applicator brushes: Benda® Brush and Benda Micro flocked applicators. Realizing the importance of asepsis in the dental office, we developed the LolliPack® single-use package, which is now the standard application method for fluoride varnishes and other unit dose materials. FluoroDose® Fluoride Varnish has been recognized as the best Fluoride Varnish for the last several years. Centrix also offers the most complete line of Temporization Materials: Tempit® for filling, Access® Crown for temporary Crown & Bridge, and NoMIX® temporary cement. And Centrix is forging new paths in impressioning with NoCord™ VPS, the first one-step, self-retracting impression material, and the Couture line of esthetic restorative products. Centrix products are available from all leading dental distributors or by calling Centrix at 800.235.5862. 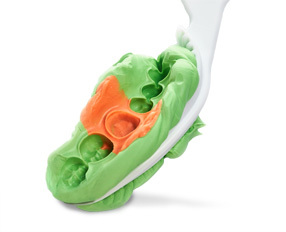 To learn more about the Centrix family of products, visit us online at http://www.centrixdental.com.